From the end of one journey, though, came the beginning of a new and unexpected one. One of the members of the fledgling congregation, the mother of a son on the autism spectrum, came to Dambra with a question: Had he ever considered holding a worship service for people with special needs? What began as a service for a handful of men from one group home is now a congregation that gathers as many as 150 worshippers every week. Called Odyssey, it meets at the Arc of Dutchess, a social-service agency in Poughkeepsie that serves and advocates for people with intellectual and developmental disabilities. 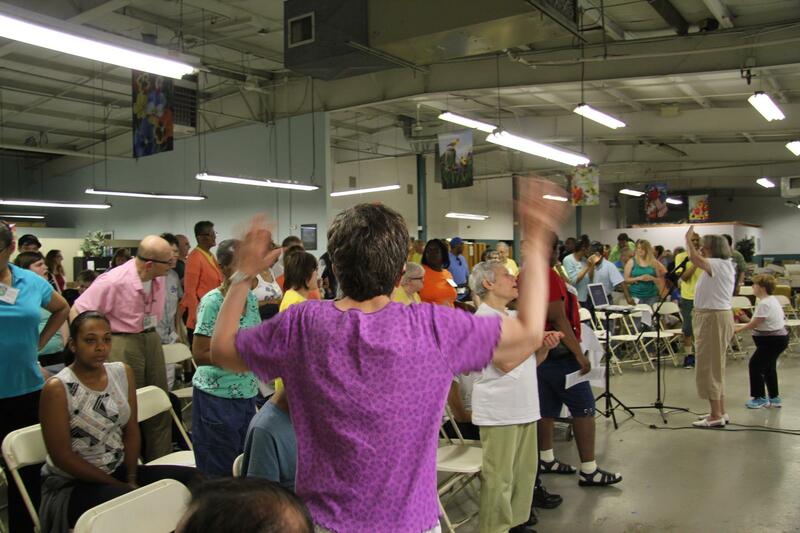 The Arc provides a workshop space that’s converted every Sunday into a sanctuary. The development of a radically accessible worship service required much trial and error. “We had to adjust basically everything,” Dambra says. The disabilities that the congregants bring into Odyssey are dizzying in their diversity: Some come in wheelchairs, some are nonverbal, some cannot move physically on their own, while some have conditions that aren’t visibly discernible. Dambra says that their biggest mistake early on was underestimating the capabilities of the congregants: “We felt we were ministering to people with special needs, and the big mistake was not recognizing how capable special-needs people can be if given the chance.” Today, those in the congregation lead prayer, serve as greeters, usher, and serve communion. One woman is on the leadership team. And one man has even preached. “He came from a Baptist background growing up,” Dambra says. “He would pray these very deep, very articulate, Spirit-filled prayers.” When given a chance at the pulpit, he unleashed a powerful sermon about forgiveness. Odyssey has also added a monthly Bible study for the entire congregation as well as a monthly social evening, “an opportunity for folks to come together from the different group homes strictly for fellowship, to hang out, to have some fun,” Dambra says. Some group homes also host smaller Bible studies. That beautiful collection of God’s people has something to offer the broader church too. By their very presence, they preach to us about the wideness of God’s welcome. And by their blossoming in this sacred space, they encourage us to see them as whole human beings, loved fully by God. They aren’t issues, they aren’t causes, and they aren’t defined by their disabilities—they are unconditionally beloved children of God.